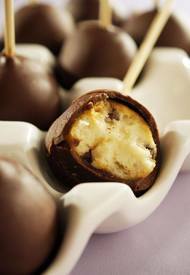 In honor of National Cheese day, we present these easy and unique Chocolate Dipped Cheese Balls! The center is softer than cheesecake and reminds me more of a cream cheese truffle. You might choose to dip in nuts or other candy topping before the chocolate sets up completely. Mix softened cream cheese and butter together on medium speed until well combined. Add zest, vanilla, and sugars. Mix again until well combined. Place in freezer for at least an hour or overnight. Scoop into even sized balls and roll into crushed graham crackers. Roll into uniform ball and place on parchment on a small baking sheet. Place graham cracker coated balls back in freezer to set (about 2 hours). Prepare metled or tempered chocolate. Push skewer or popsicle stick into each ball and dip into dipping chocolate.